Kryptonian Warrior: Iron Man 2 Casting Rumour - Emily Blunt As Black Widow. Iron Man 2 Casting Rumour - Emily Blunt As Black Widow. I'd reported a few weeks back that both Hawkeye and Black Widow are rumoured to have prominent roles in the upcoming 2010 Iron Man 2 movie. 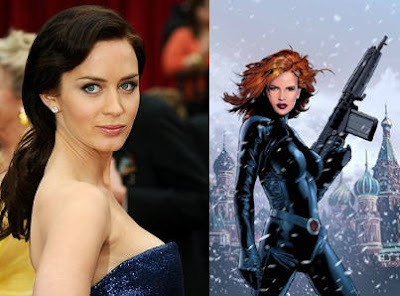 Now the news from Variety is that Emily Blunt is now set to play the role of Black Widow, aka Natasha Romanoff. Blunt seems like a strange choice to me, I'm not sure why, I can see a dozen other actresses in my head that would fit the role a hell of a lot better than her, but still it's always nice to hear casting news when it comes to Marvel movies. Marvel studios themselves haven't confirmed Blunt yet but as with Sam Rockwell and Micky Rourke it's only a matter of time.